This post is part of the Travel Handmade series, for more great travel bag posts click here! I’m excited to be a part of the Travel Handmade Series today. This series was put together by Megan and Jeni and is 2 weeks of reviews of all kinds of handmade bags for all kinds of purposes from many different blogging sewers. Today Angela and I are talking about Travel Purses. I decided, since I don’t have to travel extremely far for The Sewing Summit, that I would make a new messenger bag to take with me. Also to have on hand for basic running around activities. Or maybe I’ll be a messenger of some kind. For this bag, I used my 32-minute Messenger Bag tutorial. It had been a while since I’d made one and I wanted to see if I could really do it in 32 minutes. Well throw in ironing perler bead creations, breaking up a couple of fights, getting people popsicles, etc to the time table and I don’t know exactly how long it took to make it – but I do know it was quick and easy. Despite the circus going on around me, I still easily finished my bag in one afternoon. 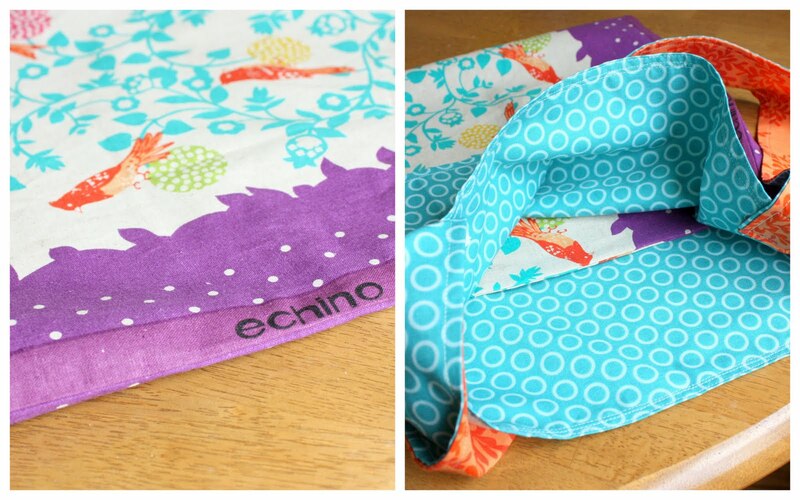 I used a gorgeous Echino fabric for my bag. I received this pretty piece of fabric from Ashley in North Carolina. (Hi Ashley!) We met briefly at Quilt Market in Salt Lake last spring and I was telling her how much I loved the Echino fabrics at sample spree, but didn’t buy any – at which point she offered to send me some from her stash. I was dumbfounded at her generosity and I’ve been waiting for just the right project to use them – and this worked so well! I even kept the Echino selvage as part of the design. I love my funky new bag and I love that the Echino fabric is a slightly heavier weight fabric than just quilter’s cotton. The blue liner/strap fabric is from My Mind’s Eye for Riley Blake and the orange is from Nest by Valori Wells. Another favorite, tried and proven bag I’ve made is The Wasp Bag. You can find the free pattern download for this bag here. Another favorite handmade purse that I’ve tried personally, is the Buttercup Bag. You can see mine here and you can download the free pattern from Made By Rae. Love this one. Check in with the Travel Handmade Series all week for great handmade bags (of all shapes, sizes and purposes), reviews, and links. I was so glad for the motivation to make something new and it felt so good to finish something at the sewing machine. For a quick finish of your own you can find the tutorial for this Messenger Bag here. Have fun! That was the perfet fabric for that bag, it looks like it was made for it! I love your new bag! It looks really great!!! I think I&#39;m going to have to try and make one! It looks like the perfect size for running around town!!! My 12 year old just made that bag for her best friend. She loved it so much she&#39;s cut out another, now just needs to sew it up. Its a great beginner sewing project–along the same lines as a pillow case, but much more fun for a tween. Thanks! That&#39;s such a cool messenger bag! I absolutely love it! I like your messenger bag. Capable of carrying a little or a lot of stuff if you are traveling. Nice fabrics! Really cute bag and the fabric is adorable.